Hey guys! Wow, how fast is Christmas approaching?! Good thing I’ve got Christal here today with some Chocolate No Bake Gingerbread Cookies to keep your holidays healthy but still delicious! Christal doesn’t need much introduction. 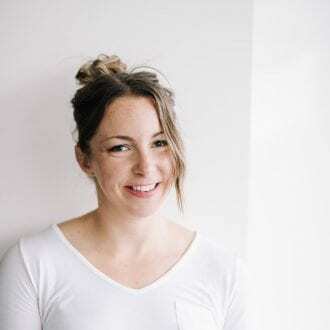 She’s the superstar blogger behind Nutritionist in the Kitch, one of my all-time favourite sites for all things healthy living. She’s been on Running on Real Food before and I’m always so honoured to have her post here on the blog. Whenever you need healthy eating inspiration and recipes, pop by Nutritionist in the Kitch and you’ll be ready to rock in no time! Thanks for being here today, Christal! It’s Christal from Nutritionist in the Kitch here! I’m super excited to be guest posting again for Deryn at Running on Real Food! Deryn and I have been “blends” (blogger friends) for a couple years now and it’s awesome to be able to support each other in our blogging journeys! Deryn and I eat quite differently, her being vegan, and I’m more of a flexitarian, but the basis of our eating beliefs is the same – eat whole, real, unprocessed foods as often as possible, and enjoy a few indulgences in between – it’s all about balance! Today I’m bringing you a super easy and delicious cookie recipe with a little festive twist, and of course, keeping it vegan! I’ve been all over the gingerbread flavour lately – I just recently posted some delicious Gingerbread Graham Crumble Bars on my blog, and I thought I’d bring this flavour over to Running on Real Food – I know Deryn loves gingerbread also, as she recently made her to-die-for Gingerbread Bites! These cookies bring in that delicious gingerbread flavour, with wholesome ingredients, and a dose of chocolate! I love to make indulgent treats like cookies secretly healthy by adding in fiber rich oats, natural sweeteners like coconut palm sugar, or dates, or even bananas, and throw in some healthy fats and proteins with raw nuts! The key ingredient in these cookies is unsulphured molasses, which is full of iron, magnesium, and B vitamins, and it hits low on the glycemic index scale, making it a nice slow releasing sweetener. These cookies are the perfect holiday treat to serve this winter to friends and family, and for yourself to enjoy a daily dose of sweet gingerbread flavour, guilt free! In large pan combine the oil, vanilla, coconut sugar, almond milk, spices, and cocoa powder. Cook over low-medium heat until all ingredients have melted together. Continuing stirring frequently until the sauce comes to a low boil. Let boil for 1-2 minutes. Remove from heat and stir in the almond butter and molasses. Once the almond butter and molasses are melted into the sauce, stir in the oats. Stir to coat the oats. Drop the a spoonful of batter onto wax paper, and repeat until the batter is used up. Let cool until the cookies harden. Christal Sczebel is a Holistic Nutritionist and Registered Massage Therapist. She has a passion for helping others discover their best health through optimal nutrition and embracing a healthy lifestyle. Through education and inspiration, Christal aims to empower others to live a healthier lifestyle, experience true wellness, and to create, eat, and enjoy real whole foods. You can find delicious and healthy recipes, tips on nutrition, healthy living, fitness, and healthy travel on her blog, Nutritionist In The Kitch. Just had the delight of making these and they are soooo delicious! Used rolled oats instead of quick oats and coconut milk instead of almond and they turned out wonderful. Thanks for posting! My mom used to make something similar to this when I was a kid. So glad to have found this recipe. Thank you! Could i sub molasses with something else? You should be able to substitute with maple syrup or honey, however you won’t get the same gingerbread flavour and you may have to adjust the amount to get the right consistency. I hope that helps!